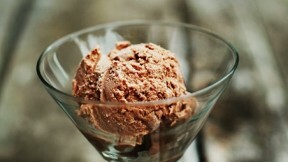 A fabulous vegan chocolate ice cream recipe from Alice Currah of SavorySweetLife.com. See the full post at Kitchen Explorers. Whisk the coconut milk, sugar/agave, and cocoa powder until well mixed. Pour the mixture into your ice cream machine bowl and follow the manufacturer’s directions. Freeze the ice cream immediately after churning. Coconut milk can often be found in the Asian section of your local grocery store. I use Chaokoh brand. No not substitute a light coconut milk for the regular. Otherwise the texture of your ice cream will be icy.